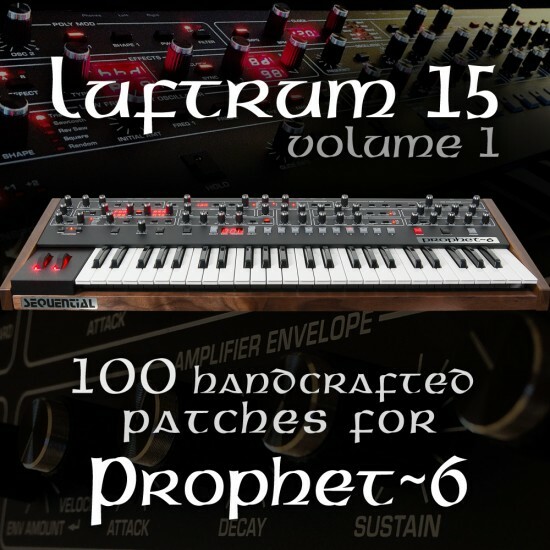 For the mighty DSI Sequential Prophet-6 comes Luftrum 15, a collection of 100 handcrafted synth patches featuring airy analog pads to sparkling arpeggios, retro lead..
For the mighty DSI Sequential Prophet-6 comes Luftrum 15, a collection of 100 handcrafted synth patches featuring airy analog pads to sparkling arpeggios, retro leads, delicate keys and synthwave style basslines, taking the Prophet-6 to another dimension. Luftrum 15 is inspired by synth sound explorers as Daft Punk, Vangelis, John Carpenter, Royksopp and Jean Michel Jarre and if you enjoy the soundtracks of Blade Runner, Stranger Things, Drive and Tron you will be thrilled with the harmonious influences found within the depth of Luftrum 15. Watch the 6-minute YouTube demo below playing a handful of patches from the soundset, out of the box and using only the onboard effects. The soundbank is compatible with both the desktop and keyboard version of Prophet-6. Note: All patches are created outside any external editor (SoundTower etc.) which means the patches are not named inside Prophet-6.